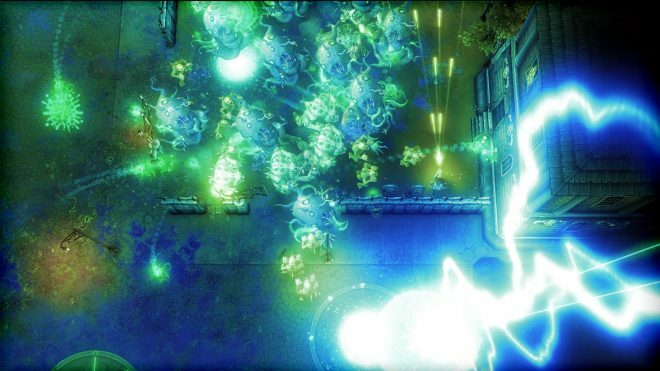 In Tesla vs Lovecraft, you’ll find a top-down, twin-stick shooter. 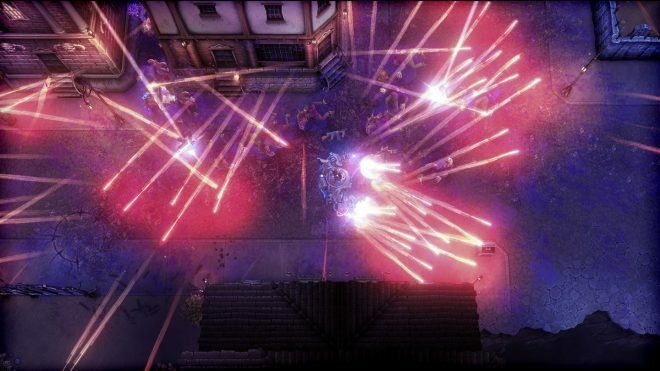 Finnish developer 10tons are no stranger to the formula; previous games Crimsonland and Neon Chrome both fit the formula. Neon Chrome was a rogue-lite set in a cyberpunk apartment block, while Crimsonland is perhaps the closer comparison to Tesla vs Lovecraft as you fought monsters in a relatively open level. The backdrop to the game is that Nikola Tesla is set to unveil “his greatest invention,” and horror author H. P. Lovecraft is intent on stopping him and so he unleashes the monsters of his Lovecraftian universe to take on Tesla. 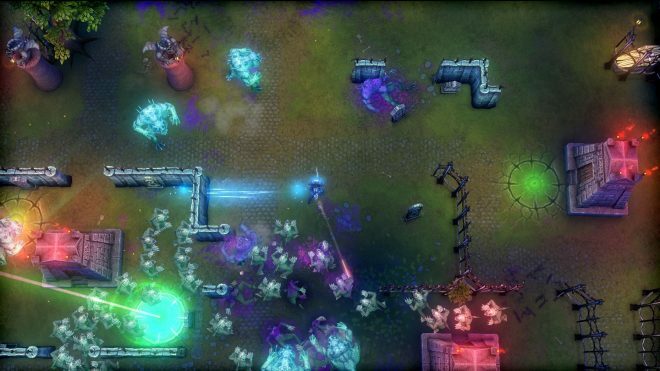 You play as Tesla, and after a couple of introductory levels where you get to grips with shooting, learn to teleport and are given a battle mech, the game begins ramping up the challenge quickly; the weapons get more varied, the perks and abilities more numerous and the monsters more deadly. You start each stage with a revolver (after spawning with the mech, which quickly depletes) and must pick up other guns to use them. Gaining XP will let you level up, at which point you can select a perk, including things like faster reloads, shooting extra projectiles per shot, or periodic health regeneration. Each stage is started at level 1 with zero perks, while abilities can be picked up like guns that let you shoot thunderbolts, drop a 10-ton weight or perhaps drop lightning rods which deal damage over time. While levelling, guns, perks and abilities reset with each new stage, there are meta upgrades available which do persist between stages. These include things like a longer duration for the mech each time it’s spawned, or the possibility of shuffling which perks you get when you level up. Gameplay feels good — First of all, they nail the basics. Tesla vs Lovecraft is just fun to play. Its assortment of weapons are varied and feel good, and each one has its own characteristics. Monsters are varied too and have their own patterns. Each new weapon and monster is introduced over time, meaning you build up an understanding of what works against what, which perks and abilities you like to use, and a strategy emerges. Perks, abilities, guns change approaches to stages — Each stage is a clean slate, beginning with the same revolver. That means anything you want to use against the monsters has to be picked up or earned via leveling. That randomness means you might not get a single gun you like, but still need to adapt to the situation. It introduces a need for adaptability that I appreciated, and quick thinking will win out in a lot of cases. Nice length to the campaign — The first go through the campaign went by quite quickly even though it was two or three hours. Short stages make it very easily digestible (though I sometimes wish there were longer stages). The overall goal of each level – to clear it of all monsters – is broadly the same, but a variation in which enemies spawn, which tools you have at your disposal, and the environment, keep it interesting. Compelling boss fight — While in very general terms, the boss fight is a case of managing many more monsters on screen, it’s compelling. It introduces a second mechanic to keep track of, while it’s also the first stage to take significantly longer to complete, meaning you get to unlock more perks, spend more time with a gun you like and generally feel more powerful in the game. New game plus changes mechanics — There’s a new game plus featuring two new “planes” on which to defeat Lovecraft, in which the game mechanics get changed up in a slight but interesting way. In the Aether Plane, the second run through the campaign, the aether crystals are now harvestable on stages instead of solely being rewards for hitting certain milestones of monsters killed. 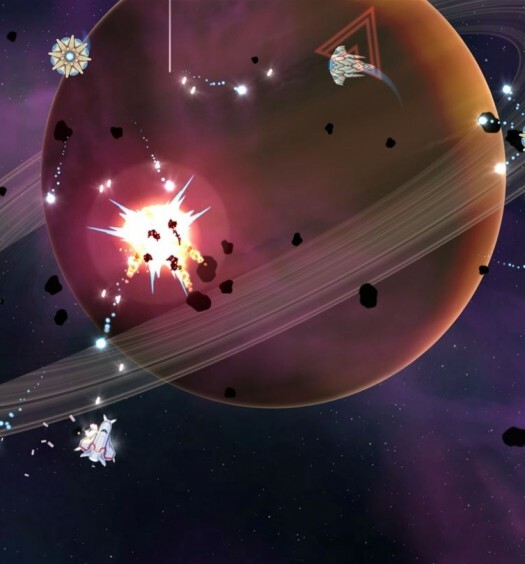 These aether crystals can be spent on the meta upgrades, and harvesting them on a stage becomes a risk-reward decision between shooting at advancing enemies or shooting at the crystal; plus you’ve then got to pick it up, possibly in the middle of a swarm. Interplay between on-foot and in-mech action — After spawning on each stage in the mech, it has a set duration before disintegrating. After that, you’re on foot and fighting, but can always go pick up a part of the mech. Collect all six, and you can drop it back in with the A button. Keeping the mech available is interesting strategically, as it’s great at clearing out large masses, but its short duration means you cannot rely on it too heavily. All stages were short — Immediately linked to the previous thing that I did like, there were not enough stages of greater length. As each level is a fresh start, it generally also meant that by the time I had perks I liked and could feel like I was chewing through crowds of monsters, the crowd would dissipate because there were no more of them spawning. With the number of levels, there are, the ability to get through them in under three minutes each makes for quicker progress, but I couldn’t help but feel that the game would have benefitted from fewer levels and greater variety in their duration. Achievements — This is certainly nitpicking on a scale where even an atom seems large, but playing through it I kept expecting more of the game’s features to be included as achievements. For instance, there’s an endless mode without achievements tied to it, and maybe there could have been one for the first time hitting level 10 on a stage. Instead, most achievements are tied to numbers of certain monsters killed (which are all easily obtainable on the first run). But like I said, I’m nitpicking. 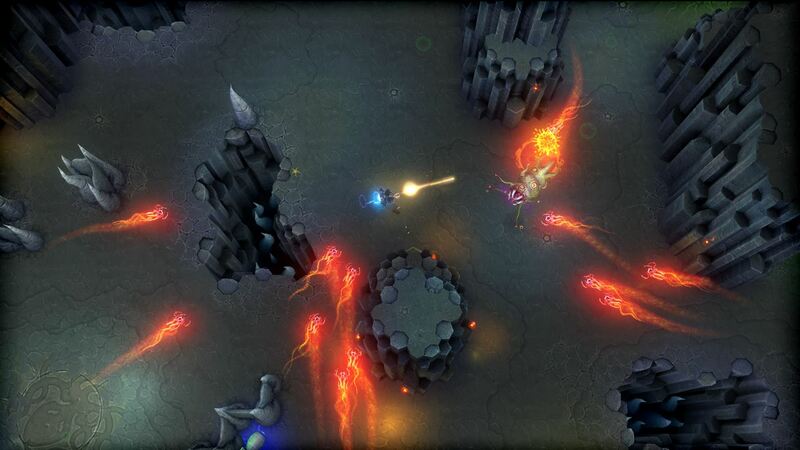 Tesla vs Lovecraft is a great twin-stick shooter. I liked 10tons’ previous efforts, and I think this one is very satisfying to play. Its enemies, guns, perks and abilities are all varied and play well with each other, and the first time I stacked several “one extra projectile fired per shot” perks and jumped in my mech, I couldn’t help but grin at the hail of bullets I was unleashing. Tesla vs Lovecraft was developed and published by 10tons Ltd. The game released on March 16, 2018 for $14.99. A copy was provided for review purposes. 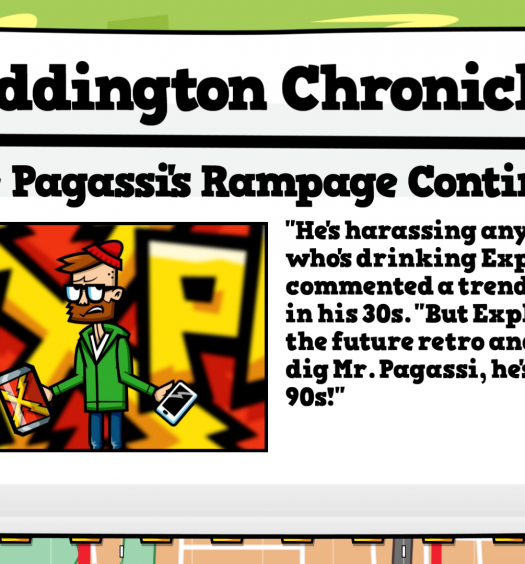 Maxen rounds up the latest releases each week and reviews games. He doesn't like writing bios.